1 Package of 48 realistic looking smoke grenades. 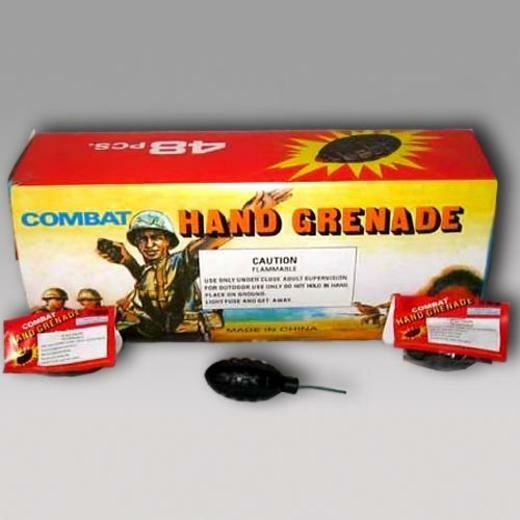 Smoke grenades are a beloved classic firework toy that is perfect for pranks, games and outdoor fun. Each smoke bomb has a 1" fuse and a smoke time of approximately 1 minute and emits tons and tons of smoke. Great for birthday parties, paintball, goodie bags and more. Outdoor use only. Fireworks should always be used under adult supervision. L: 12.0 in. W: 6.0 in. H: 3.0 in.